Does your horse suffer from allergies, asthma, or COPD with mucus involved? Have you tried Wind Aid for relief of symptoms? Wind Aid is in a Glycerin base. Glycerin is a water-soluble lubricant and moisturizer. Our Glycerin is top quality, human grade and Kosher. It is a plant-based product, not a petro product. Ours comes from Palm Kernel oil. It is used to seal wedding cakes, given to elderly in nursing homes when they cannot swallow pills or when medications dry their mouth, and used in foods and cosmetics. The base of Wind Aid offers lubrication to the throat. It also has Peppermint Oil and Eucalyptus Oil, each offering all sorts of respiratory benefits as well as that “head-opening” sensation. Wind Aid also contains Potassium Iodide that works in the body as an expectorant, drying and clearing the airways of mucus. This is what sets Wind Aid apart from other breathing aids on the market. It is not a cheap cough drop but an expectorant. It is important to allow the product time to work. If you give it right before competition then you only receive the benefit of the glycerin, peppermint & eucalyptus oils. If your horse shows improvement when it is given right before competition then MUCUS may not be an issue with your horse, it may just be a dry throat or dusty dry conditions complicating the breathing. Hawthorne Products does offer Glycerin and a Glycerin & Peppermint blend and this is all some horses need. In the winter months Glycerin and Glycerin & Peppermint is often used to moisturize the throat from the dry, frigid air. But for the horse with mucus, you need to give Wind Aid 4 or more hours before or start several days before an event, dosing daily, allowing time for the Potassium Iodide to clear the mucus from the airways. It simply needs time to do its job. Wind Aid will not fix mechanical problems like paralyzed flaps but it will clear the airways of mucus. Any horse with a physical breathing problem is additionally hindered if it has mucus in the airways. Wind Aid is not an antibiotic and it will not cure infections (bacterial or fungal) or viruses but it will offer relief from the symptoms. It has proven to be extremely beneficial to horses with allergies, asthma or COPD when mucus is involved. There are some cases where horses do not create mucus, instead the airway passages actually have spasms and constriction, drastically reducing air flow. In these cases, bronchial dilators and steroids are beneficial. You need to consult with your vet for these types of conditions. If your horse develops yellow discharge from its nostrils, always take it’s temperature and/or consult a vet. Wind Aid is not a fever reducer and if this horse has a severe fever, medical attention is needed. Wind Aid is not to be used as a Head wash. It is intended for oral use only and it is important to know that your horse received it, how much and when. Wind Aid is not a steroid and will not test. It is not a bronchial dilator. It is not a performance enhancer but allows for the open airways, free of mucus. 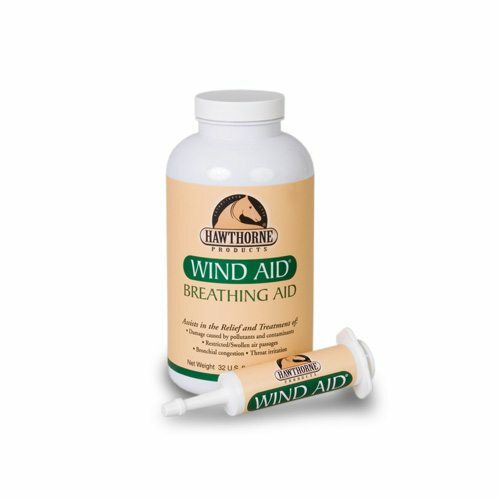 Wind Aid comes in a quart bottle with a recommended dosage of 2 ounces (60 cc) and a pre-filled Oral syringe with a concentrate formula in a 1 ounce dose. These doses are based on a 1000-pound horse. If you are dealing with a small horse or pony adjust the dosage accordingly. Wind Aid has been used on sick horses, foals and pregnant mares without issue, HOWEVER, always consult with your vet, especially if the horse is sick. Each horse is different and each horse should be treated as a special case. We do not recommend putting Wind Aid in the feed. It is important to know your horse received the product, so please administer orally. If the horse receives two doses in a day, it will not hurt the horse. We have given some horses 2 & 3 doses a day during a loading period for relief in severe cases. We recommend having a chart on the stall listing times a horse received medications or appointing one person to the task so products are given correctly and someone is responsible. If your horse experiences breathing issues daily it may be necessary to give the horse Wind Aid daily. You may find that you can adjust the dosage after a period of time. You may be successful with giving a half dose daily after a period of time on a full dose, but some horses require the full dose daily during allergy seasons. If your horse only shows symptoms in certain environments, like one particular show arena, or when you trail ride in certain states, then start a day or two before and only give it during the time the horse experiences issues with allergies. If your horse has allergies and you choose to try Wind Aid then you should see some benefits within a week or two if you administer the product as recommended (a dose a day). If you do not see any changes within 2 to 4 weeks then Wind aid is not going to help your horse. Some horses require a vet to scope the horse to determine what is going on inside the throat and airways. Some people use Wind Aid when horses have a respiratory infection to help with the relief of a stuffy head and offer better breathing. In these cases, I would suggest the full dose until the symptoms subside. In competition horses, I would advise giving Wind aid the day before and the day of the competition to insure optimal breathing. If you know your horse has mucus issues, I would start 3 or 4 days before and stay on it through the competition. As I said, some horses with seasonal allergies have to stay on Wind Aid for months at a time. In these cases some people opt to just give it when they ride but keep in mind this horse is still having their airways restricted with mucus and they are not breathing freely or comfortably. You may want to consult with your vet about an antihistamine or some other allergy medication offering relief. If you have any questions about Wind Aid or its use, please feel free to contact us. Use Code: WindSummer2017 to get 25% off your next purchase of Wind Aid, offer expires 9-30-17.